Dealing with the temporary frustration of not making progress is an integral part of the path towards excellence. In fact, it is essential and something that every single elite athlete has had to learn to deal with. If the pursuit of excellence was easy, everyone would do it…The secret is to show up, do the work, and go home. This is the type of thinking we put into the Formula 7 course. 1 week of evaluation, followed by 7 weeks of solid, tried and proven health principles. 100% focus on daily behavior, melded with a zen-like non emotional, non-judgmental implementation that doesn’t worry too much about results. 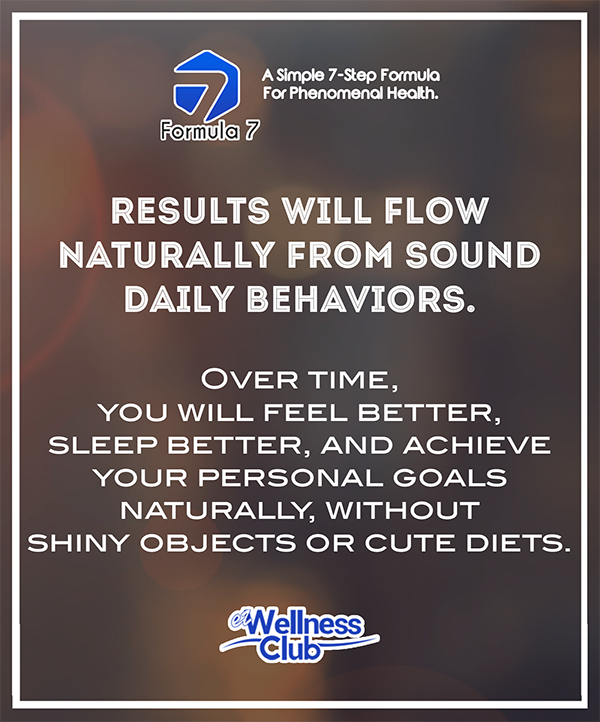 Results will flow naturally from sound daily behaviors. Over time, you will feel better, sleep better, and achieve your personal goals naturally, without shiny objects or cute diets. So commit to the process. Focus on behaviors. Minimize expectations of outcomes. Joy in the journey! EZ Biohacking: A Quick and Free Way to Get Great Health Data	If you want to change the world, make your bed.